The ‘bread and butter’ of itinerant support to students with hearing loss is often considered to be ensuring communication access, supporting language development, and self-advocacy skills training. 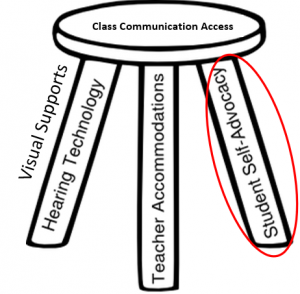 While access relates to ADA requirements, and supporting language is linked to academics, training in self-advocacy is too often considered to be non-academic and therefore not necessary. One thing we know for sure about our students is that they will miss or misunderstand more communication than their peers. This is the basis for ongoing language and vocabulary issues and underlies the need for self-advocacy. Access and teacher accommodations cannot close all ongoing speech perception or communication gaps. 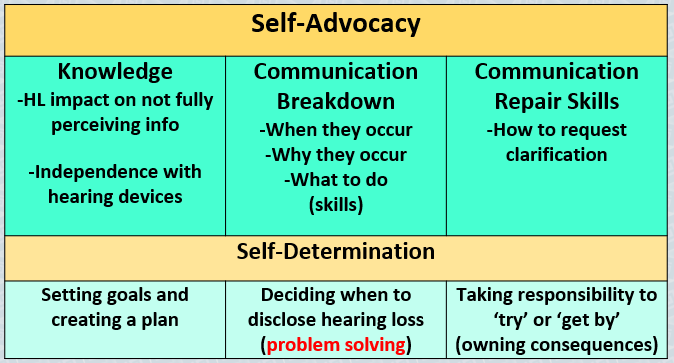 It truly is necessary to teach self-advocacy skills to enable students to fully participate in the classroom and act appropriately when they know they have not fully received or understood information. If a student who was low vision was continually knocking into people, desks, and classroom walls due to the inability to clearly see everything, a vision specialist would likely be called in to assist the student in developing appropriate orientation and mobility skills. A student with hearing loss often incompletely hears, misses spoken information, or misunderstands what is said. Self-Advocacy training is to a student with hearing loss what orientation and mobility training is to a student with visual impairment. Students do not know what they didn’t hear because they didn’t hear it – yet they are often held accountable for receiving and fully understanding this information. Full participation in the classroom requires that a student recognize when a communication breakdown occurs, and self-advocate for their listening and learning needs. Students who are deaf or hard of hearing must have the knowledge and skills to access accommodations and support in any setting and as an integral part of an independent adulthood. Ideally, students would have instruction in self-advocacy from preschool through grade 4 (about age 10). As they reach the tween and teen years, focus should change on supporting the student’s ability to problem-solve communication issues as part of their self-determination of future goals. Following are basic questions that students with hearing loss typically require instruction in so that they can understand their hearing needs and respond appropriately. 1. What does it mean to have a hearing loss? 2. Why do I have problems understanding (relate to hearing loss and language issues)? 3. How does my hearing loss affect me (school, socially)? 4. When do I have problems understanding what people say? 5. How important are my hearing devices? 6. How do I know when my hearing devices are not working? 7. What should I do when they are not working? 8. What can I do when I know I have not heard what was said (specific self-advocacy & communication repair strategies)? 9. How much am I willing to have the hearing loss impact how well I do in school (planning/future goals)? 10. When is it critical for me to disclose my hearing loss (problem solving)? 11. What are my legal rights to access, supports, and services? We need to encourage students to understand their disability. They need to know the functional limitations that result from their disability. Understand their strengths and weaknesses. Be able to explain their disability to others. Be able to explain their difficulties in the past, and what has helped them overcome such problems. This should include specific adjustments or strategies that might work in specific situations. They must practice explaining their disability, as well as why they need certain accommodations, supports, or services. Success in the general education setting requires an ongoing instruction program in self-advocacy skills needs, including hearing aid independence, to be a part of the services provided to students with hearing loss as part of their IEP or 504 Plan.